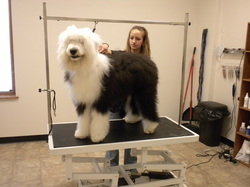 We are a full service pet grooming salon in Howard, WI, and we love animals! We know your pet is an important member of your family, and we promise to make him or her feel safe and comfortable while in our care. It is important to find a dog groomer who you and your dog can trust, one who makes you feel comfortable and can provide quality grooming care. Good grooming practices are essential for maintaining health and happiness for you and your dog. Clipping Your Dog’s Nails – Many owners are squeamish about trimming their dog's nails for fear of hurting their pet or making him bleed. We know how to find the "quick", the blood supply to the toe nail, and we can trim your pet with the least amount of trauma. Cleaning Your Dog’s Ears – We can remove excess hair inside your dog’s ear canals and give the ears a thorough, safe cleaning. Cleaning the ears prevents a buildup of wax and dirt, which can cause yeast and other problems. It can also help to prevent ear infections and ear mite infestations. Recommended Grooming of Dogs is Approximately every 4-8 weeks. The cost of a professional grooming depends on the size and temperament of the pet, the condition of the coat and the cut you are requesting. Please understand that it is very difficult for a groomer to give an accurate quote over the telephone without seeing the pet, as even two pets the same breed may require different type of grooming work. Your groomer can give you a "starting Price" over the telephone but it would be best if you brought the pet into the groomer to discuss the specifics of the desired hair cut.